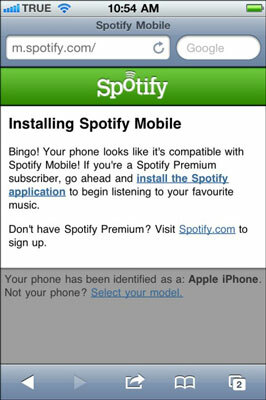 To see if your phone is compatible with Spotify Mobile, just visit Spotify on your phone. Spotify automatically detects the phone you’re using and presents you with a link that you can click to directly download the app. If Spotify for some reason can’t detect the phone you’re using or has thrown up the wrong model, you can manually select your phone from the drop-down list that appears and then tap the Go button. Spotify directs you to the place where you can download the app. Judging from that list alone, there are close to 100 officially supported models, and the list is growing all the time. Still having trouble? Then go to the Spotify Mobile web page. You see a text box in which you can enter your handset number. Spotify then sends you a text message that contains a link to download the app. Your number won’t be used for any marketing purposes, and Spotify won’t charge you to receive the text message, but note that your carrier may impose its own charges. You can also try to find your phone from a list at the bottom of the Spotify Mobile web page. You can view by manufacturer (Apple, Google, HTC, Huawei, INQ, LG, Motorola, Nokia, Palm, Samsung, Sony Ericsson, or ZTE) or mobile platform (iPhone, Android, Symbian, Windows Phone, or Palm). For those of you downloading Spotify from the iTunes App Store for your iPhone, you need to have an iTunes account that’s registered to one of Spotify’s launch countries — otherwise, the app doesn’t appear in the search results. On your iPhone, check to see which user account is logged in by going to Settings→Store to view your Apple ID. If that account isn’t registered to one of Spotify’s launch countries, tap it and select Sign Out to change to the account you’ve registered in one of these countries. 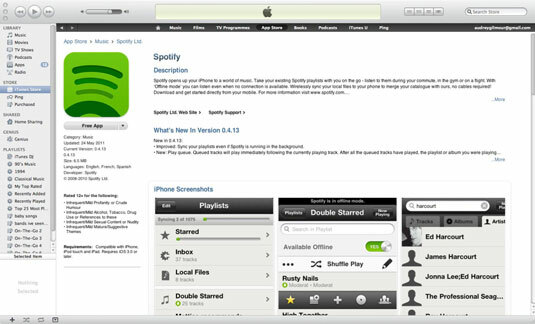 You can download the Spotify app from within iTunes, all ready and waiting for you to download from the iTunes Store. You need to be logged into the store to find and download it. Next time you connect your iPhone to your computer in iTunes, iTunes copies the apps to your phone. 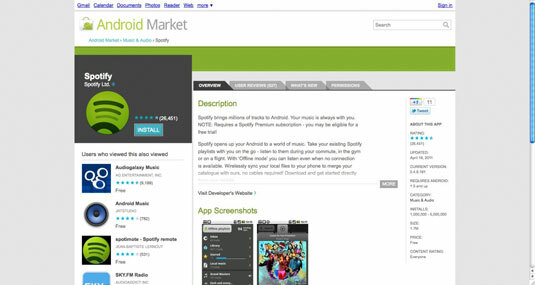 You can download the mobile app from the Android Market website. You need to log into your Google account to grab it, and it then downloads to your phone as long as you’re logged in through your Android with the same Google account as you are through your computer.